Property Management contracts now available at Less than 1 GBP Per day. servicing and maintenance for your villa or apartment in Bulgaria. We can manage, advertise and rent your property, and offer the best builders, gardeners, accountants, security and insurance services. Join the best Rental Management service in Bulgaria! Renting your Bulgarian property can be hard work. you need excellent advertising and promotion, a lot of patience and a lot of free time to respond quickly to all enquiries before the customers go elsewhere. You also need to know that your property will be immaculately maintained and presented for your guests arrival, and that you have a committed team on hand locally to deal with any problems they may have during their stay. We are committed to ensure ensuring each booking goes as smoothly as possible. 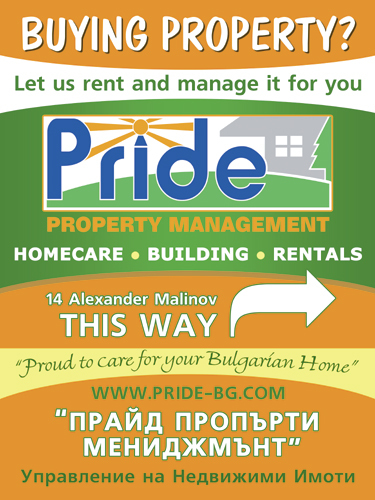 Our Pride Rentals website is the biggest database of fully-managed holiday rental properties in Bulgaria. We also advertise your holiday home on the best holiday rental websites for Bulgaria, as well as in various targeted international press. Our villa and apartment advertising package is incredible value for money, being less than a third of the cost of arranging the same level of exposure yourself. We do everything we can to ensure the perfect Bulgarian holiday experience and many of our guests recommend our letting services to friends and return year after year!